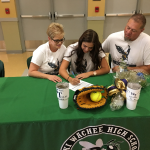 Senior softball player, Stephanie O’Brocto will continue her academic and athletic career at Wake Tech Community College, located in Raleigh, North Carolina. Stephanie has played all four years at Weeki Wachee. 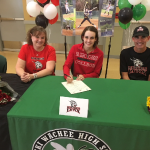 Weeki Wachee stand out pitcher, Abigail Pons, has signed to continue her academic and softball career at Rhodes College, a NCAA III institution located in Memphis, Tennessee. Pons holds just about every pitching record in Weeki Wachee history.